Cats and Kittens love grass. Growing cat grass indoors all year round is easy and fun. Cats will lie on it and eat some, which also helps keep them from eating your house plants. 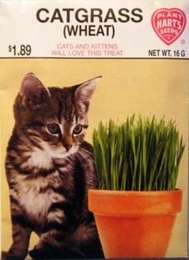 Safe and nontoxic, cat grass aids in their digestion. Take home a packet for your cat or for a cat lover you know. When plants are 3 inches tall, place it on the floor for your cats enjoyment. Cat grass is a member of the grain family and will grow tall if not trimmed.